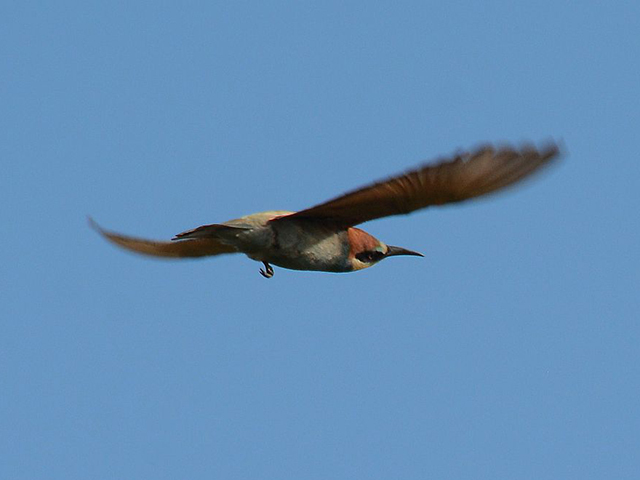 Anyone who would like to contribute and post sightings to this page, please email sightings@ntbc.org.uk . These sightings are not verified by the club and the club accepts no responsibility for the accuracy of the sightings posted here. Please do not post sightings that name breeding sites or potential breeding sites for Schedule 1 Species during the breeding season. 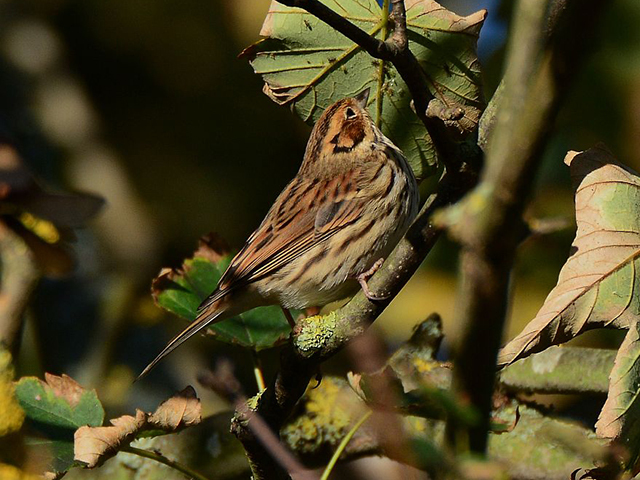 The Northumberland & Tyneside Bird Club fully endorse and support the Guidelines issued by the Rare Birds Breeding Panel in relation to the reporting of Schedule 1 and other rare breeding birds. If you wish to view a larger photo, please click on a photo you wish to view bigger and this will appear full size. A recent visit to various sites in the north of Northumberland revealed an encouraging number of finches and buntings, some in substantial flocks. At Outchester, near Budle Bay a flock of Yellowhammers had gathered this winter feeding in a stubble field and had numbered up to 150 birds at times. Lesser numbers were there when I visited but still a good few remained and on a calm, sunny morning one male even sang briefly. This weather also encouraged Skylarks to sing on high, with ten birds doing so in the area, being the first I’ve heard this year. Great to hear again them after 7 months. Further north at Elwick, there was a lot of Skylark activity, with birds chasing each other, establishing pairs and again around ten in song. In a game crop along a field edge here a large flock of Linnets fed, every now and then all taking to the air and alighting on a hedgerow. 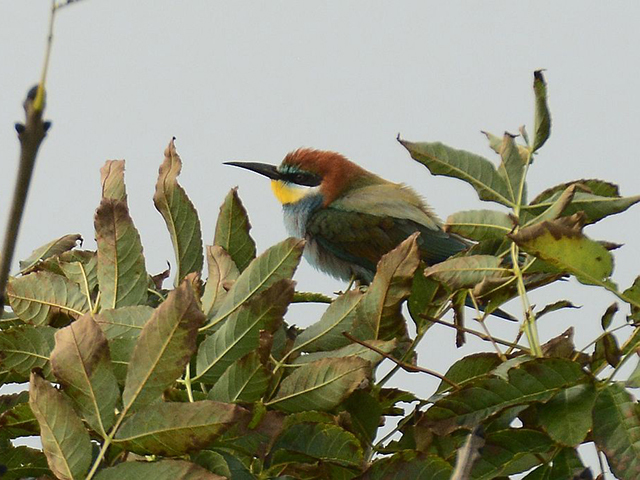 At least 600 birds were present! Not quite as many as the 700 near Morpeth in recent months. Also here were small groups of Tree Sparrows and Yellowhammers. Back at Budle, and a ‘scope of the bay revealed large numbers of geese, with around 2,ooo Pink Feet, 1,200 Barnacles ( a large number for February here) and 450 pale bellied Brents out on the mudflats. The wintering Spotted Redshank fed close by in a deep channel, picking up food items as it floated at speed down the running water. Up to Holy Island, and a female Merlin was perched on an old tree stump allowing super ‘scope views. A few Skylarks sang here too , at Chare Ends. More Brent Geese fed out in the shallows. In the quiet village, a solitary Redwing was in the churchyard where a Song Thrush sang. Down to Old Bewick next, and another good flock of feeding buntings and Tree Sparrows, showing the value of game crops in winter. Here were the most Reed Buntings I have seen in many years, with birds on every bush and flying up and down into the crop to feed. At least 65-70 were counted. A similar number of Yellowhammers accompanied them and around 50 Tree Sparrows too. A great sight indeed. As a Buzzard glided by, the whole flock took wing giving an impressive show. Another Buzzard had appeared to have been electrocuted as it hung dead from a wire, a sad end. 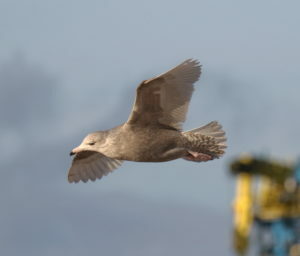 A first winter Glaucous Gull was part of a feeding throng today at the Yacht Club at Blyth Harbour. 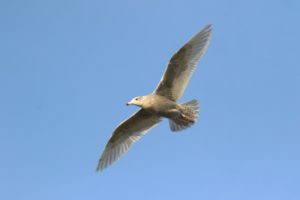 Unfortunately, no sign of the recent Iceland Gulls though. 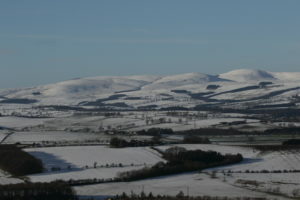 A still, sunny but very cold day with snow covering all the hills and fields greeted my arrival at the moorland west of Alnwick. A Raven was the first bird seen, as it glided by, calling. A pair of Crossbills also called in flight and rather surprisingly at this altitude, eight Meadow Pipits fed in snow free areas where cattle had been at a trough. The vast majority of the upland population of these Pipits head in autumn for warmer climes in central/southern Spain, but small numbers do remain in the county in mild winters, where most make for the coast. Another hardy bird was a female Stonechat, pouncing onto snow free patches to find scarce insects, from a sunny, south facing wall perch at the Brizlee Wood radar station. Here another Raven arrived and landed, calling on a wall. 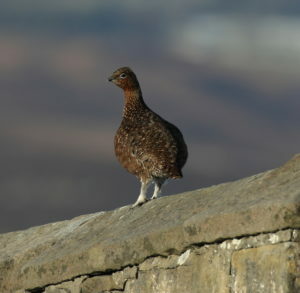 The walls were popular too with many of the Red Grouse here, seeming to prefer not to stand in the snow below. 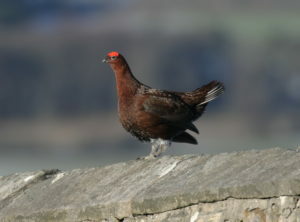 At least 25 were seen in the area. Their constant calls could be heard. Even with the temperature gauge showing a meagre 2 degrees, the brilliant sun and clear blue skies tempted 5 Common Buzzards into soaring above the station and a third Raven arrived. The main target I had come to hopefully see, was a Hen Harrier that has been seen in the area recently. After several hours of looking, the ringtail Harrier put in an appearance hunting the fell south east of the station, but was all too brief as it glided out of view. 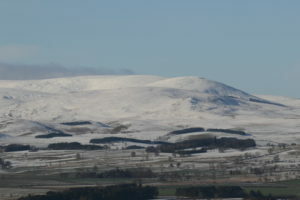 All told, a good day with stunning views of a snow covered landscape, the Cheviots looking amazing! 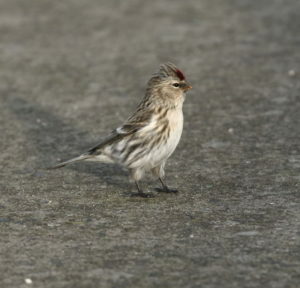 A few photos of the recent Mealy Redpoll found feeding on weed seeds on a small patch of “waste ground” at North Shields Quay. A Glaucous Gull also seen intermittently along the river and still present on 26/12/17. At nearby Northumberland Park, a Firecrest has been seen on several dates during early December. 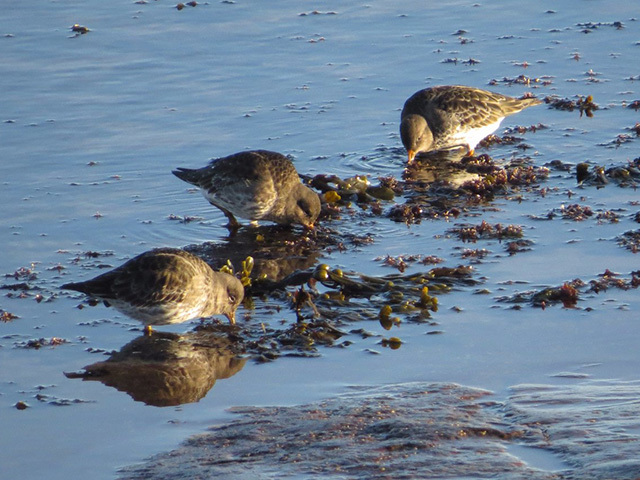 Up to seven Purple Sandpipers are frequenting Tynemouth pier area. 4 RN Parakeets just brightened up Shields Rd, Byker, flew low NW at 13.15. Grey Phalarope distant off Chibburn Mouth Druridge Bay, amongst BH Gulls. 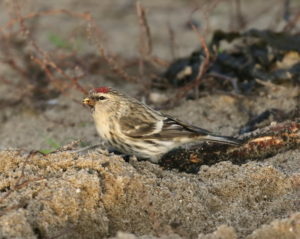 Also 2 LT Duck, & 52 Twite on beach. 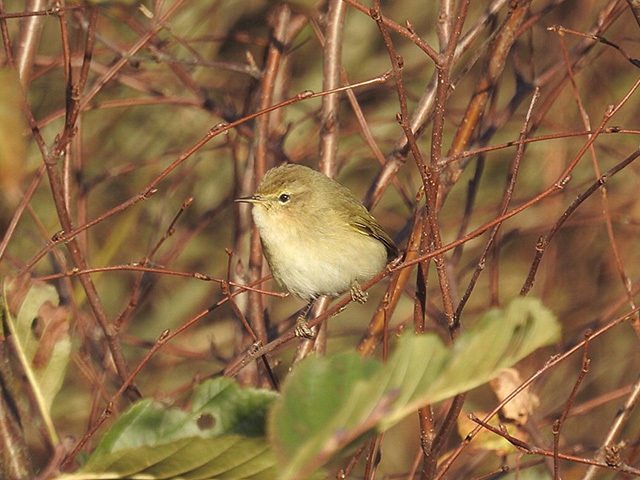 Chiffchaff happily flycatching at East Chev despite hard frost and snow on distant Cheviot. 26 Purple Sandpipers at a bitterly cold North Blyth this morning, my highest count here for many a year. Gull roost at Derwent Reservoir still quite small so far this winter. 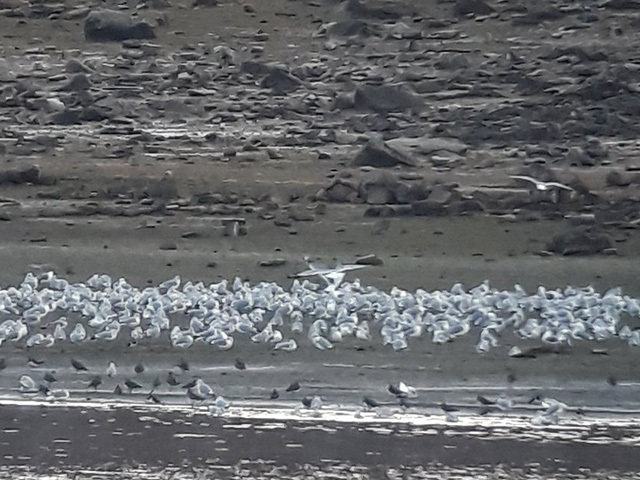 6,300+ Common Gull, 3,200+ Black-headed Gull, 15 GBBGull, 6 Herring Gull & 2ad L B b Gull. Female Merlin too. 3 Whooper Swan (2 ads & juv), Ruff & 12 Dunlin Grindon Lough. 13 Mediterranean Gulls resting on the Academy playing fields, Newbiggin this morning. 10 or more Parakeets at Nuns Moor this afternoon. Ad Med Gull at Wallsend Swallow this pm. Slavonian Grebe and Long-tailed Duck on East Chevington 10.45. 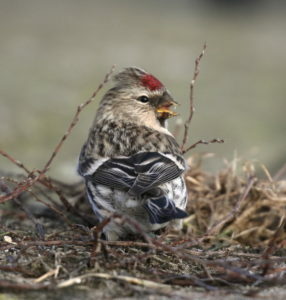 There were Big flocks of Redpolls 300 + between Hepscott and Bothal today. Single Hawfinch seen & heard in Wark by the school. 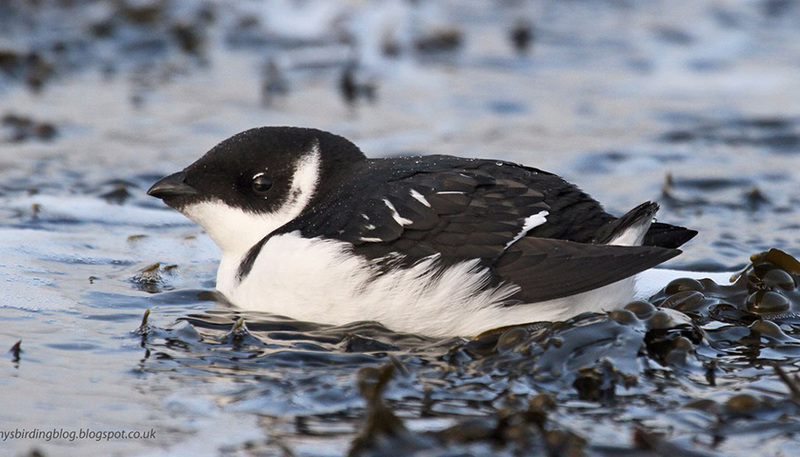 This Little Auk arrived from the south before landing in a large rock pool on Snab Point this afternoon…. There were four very tame Snow Buntings on the rocks just over the third green on the golf course today. There was also a possible Twite flock and one Grey Plover amongst the regular waders feeding. 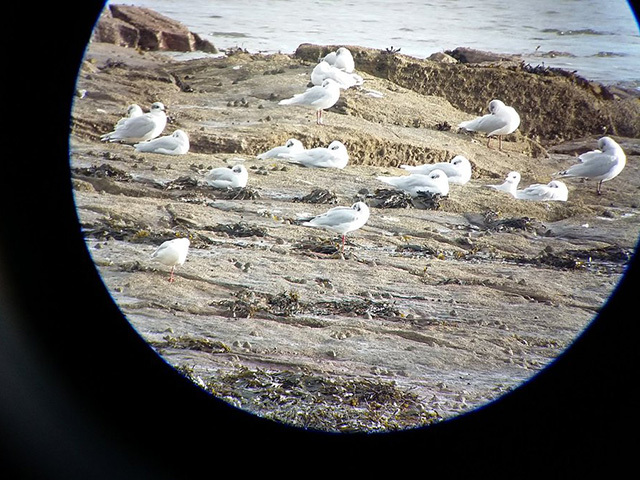 37 Med Gulls in village bay, Newbiggin inc 4 c/ringed. 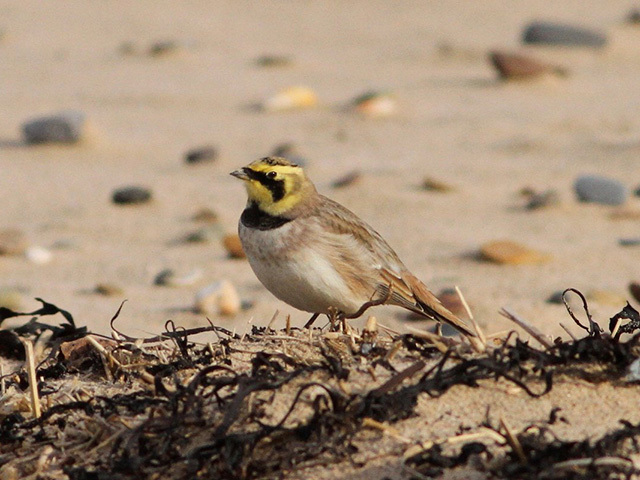 Shorelark at East Chevington burn mouth this morning. 40+ Twite plus Marsh Harrier south mile out to sea. 2nd cal yr Glaucous Gull at Budle Bay. Finally found our first Yellow-browed Warbler of the autumn this afternoon in the scrub on the W side of the road just south of Snab Point. 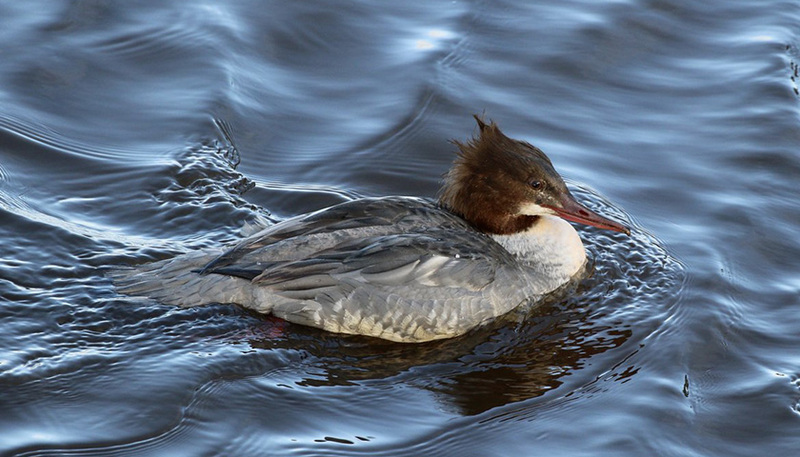 Goosander on the River Aln at Alnmouth, Northumberland. Still at least one Todd’s Canada with Greylag at Budle Bay. Another wonderful October but totally different mix to last year. Janet had caught up with the Little Bunting at Newton yesterday whilst I was minding my son’s computer shop. Out though this morning and struck lucky as Stewart Sexton & John Rutter had just found it feeding on edge of last sycamore east of ‘tin church’. They had spent two hours looking so good timing on our part. It proceeded to show really well but it’s strange stop / start movements meant that it went undetected whilst not moving. Seen in afternoon as well so hopefully may stay. Druridge Pools hits a purple patch as hot on the tails of the Red-necked Phalarope, Cetti’s & Barred Warblers came a European Bee-eater which thankfully was found early morning and remained through to 1pm before flying off West. The first twitchable for most county birders after two seen recently briefly over East Chevington. Also a Short-eared owl seen high over the pools presumably having just made landfall.